CAVU’s Flying Theatre is a modular system that can be configured into varying sizes using eight (8) passenger seat units on multiple levels facing an immersive screen. Once riders are loaded and their lap bars secured, the seat unit rolls forward into the screen. Each module has electric actuators and produces six Degrees of Freedom motion, (6 DOF) including pitch, roll, heave, yaw, surge and sway, in synchronization with the projected media, sound and/or special effects. Wind, water mist or multiple scents can be introduced from the integrated canopy above. CAVU’s Flying Theatre delivers unparalleled aerial adventures such as soaring over landmarks or high adrenaline aerial flying experiences. 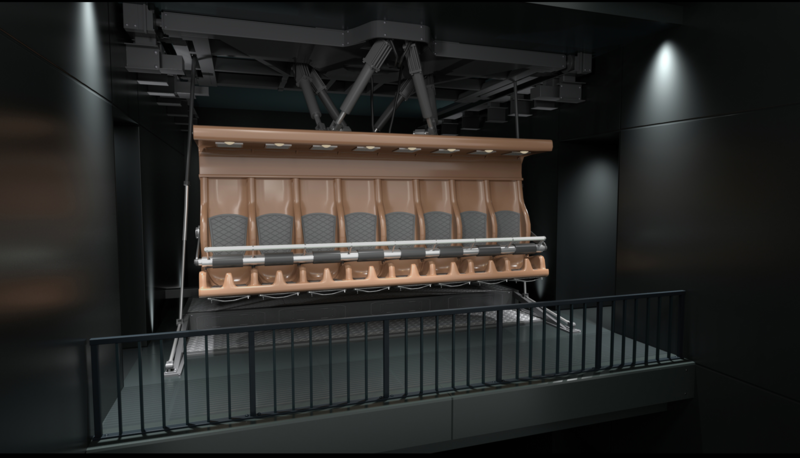 When the show ends, all seating modules return to the load/unload position and guests exit the theater as new guests enter, minimizing load/unload times.